One of a public agencies’ greatest goals and challenges is transparency and meaningful engagement with the public, and to keep pace with technological advancements that aid in that goal. The integration of smart-phones into our daily lives is now nearly seamless; what was once a curiosity is now commonplace, much like the rapid adoption and utilization of automobiles at the dawn of the 20th century. It behooves FWC then, to adapt to a public that expects interconnectivity and seamless user-experience, which led to the development of the FWC Reporter app. The main researcher involved with this project is Dr. Richard Flamm, who designed the app, and does research regarding mobile app implementation to help insure success of the app. “In developing this mobile app, our primary goal was to enhance the quantity and quality of publicly reported information to FWC programs as well as shorten response time to events like fish kills while complementing the current web and telephone-based reporting systems.” Flamm said. A screenshot of what the user sees on the reporting section of the app. “The marketplace is not about us,” Flamm explained, “It’s about our users, so the design of the FWC Reporter does not project what we as FWC employees think it should be, but what we understand our user base will accept and use. 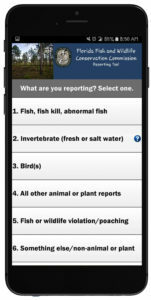 The FWC Reporter aims for the broadest user base possible.” The initial goals for the app are (1) provide a reporting platform for citizens committed to mobile communication devices; (2) include enhanced data functions like images, audio and video files that can be sent as part of the reporting package; (3) smoothly integrate with and enhance FWC’s citizen science programs, and (4) provide for outside organizations to receive reports including FDEP and the U.S. Coast Guard. The app was programmed and designed by FWC and FWRI Information Science and Management section, in partnership with the Office of Information Technology and from input from FWC offices that receive reports and the public. The decision to build the app in-house kept development costs to a minimum and allowed FWC to be more nimble for fixing bugs, providing updates and addressing users concerns. The decision to build in-house was one of several changes the FWC adopted to behave more akin to an Enterprise solution, which is more responsive and cost-effective – uncommon for government agencies. The FWC Reporter app has helped the agency remain relevant to the diverse needs of the citizens of Florida. By providing numerous avenues for interaction, the app is an attractive option for users who have something to report, but are unable or unwilling to call FWC offices. Additionally, the app helps cut down on phone traffic during peak times, such as during a severe red tide bloom, since some citizens will be reporting via the app. Technology is constantly changing, and it is our objective to align widely adapted technology to the goals of the agency. FWC Reporter officially launched in February 2018 and is available on Google and Apple app stores at no charge.